100% complete and balanced. Helps support shiny coat and healthy skin. Help support healthy digestion with quality ingredients. Help to support vitality. No added artificial colours. 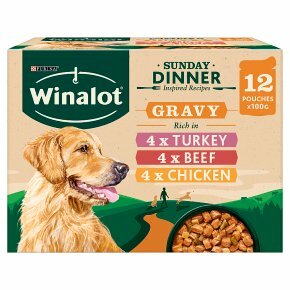 Healthy adult dogs should be fed the following amounts daily. BW in kg: 5 kg, Wet Pouches only Wet Food Pouches: 6, Wet Pouches + Winalot Dry Food* Wet Food Pouches: 2, Wet Pouches + Winalot Dry Food* g Dry Winalot Dog: 71 BW in kg: 10 kg, Wet Pouches only Wet Food Pouches: 9, Wet Pouches + Winalot Dry Food* Wet Food Pouches: 4, Wet Pouches + Winalot Dry Food* g Dry Winalot Dog: 113 BW in kg: 25 kg, Wet Pouches only Wet Food Pouches: 16, Wet Pouches + Winalot Dry Food* Wet Food Pouches: 7, Wet Pouches + Winalot Dry Food* g Dry Winalot Dog: 208 *The mixed feeding guideline table has been calculated using the PURINA® WINALOT® with beef dry product. These amounts are averages based on moderately active adult dogs at normal environmental temperatures. Individual needs vary and feeding should be adjusted accordingly. Clean, fresh drinking water should be available at all times.